This may come as a shock to my Mummy Bird, but it’s official – I do as I’m told. “Breakfast like a King (or Queen in my case)” is the saying, and that’s exactly what His Nibs and I did! Stephanie and Pete from Elements Artisan Coffee and Tea House in Derby’s Cathedral Quarter kindly invited us along to sample their breakfast dishes, so we toddled along one Saturday morning to see what was what. One of the things I always say to The Man Bird with our little blog is to expect the unexpected; you never know what lies ahead when visiting a venue. Openings vary from a few drinks and nibbles to full on menu tasting, complimentary bar all evening and goodie bags (and everything in between), and it’s the same when we’re invited to sample dishes; on occasion we’ve had a single item from the menu, other times we have literally sampled all the dishes on offer! Elements Chefs, Sam and Vicky, were clearly in the mood to showcase a variety of dishes from the breakfast and brunch menus, and we were treated to a selection of meat-containing, vegetarian and vegan dishes. 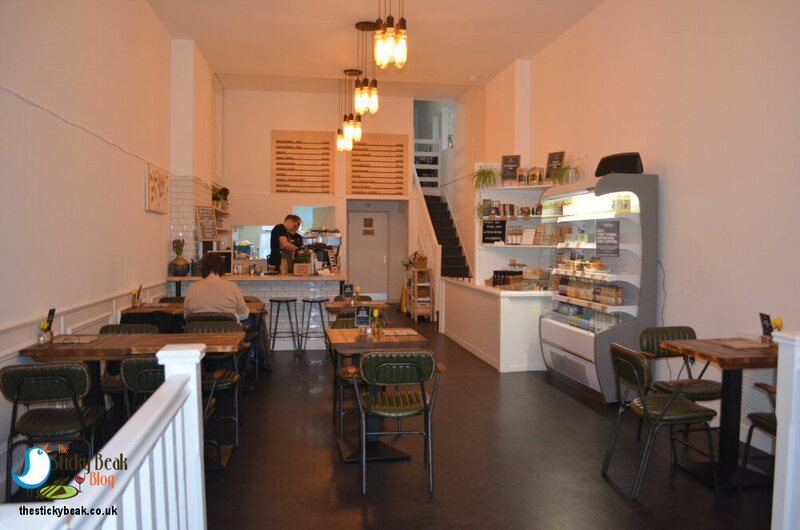 They were all incredible, and Pete partnered them with an assortment of hot and cold beverages including Kombucha, Matcha Latte, Macchiato, and a couple of V60 offerings – one Colombian, one Kenyan. The venue itself is a fantastic open space, kept very plain colour-wise on the walls (i.e. White) with the addition of Olive green modern, but very comfy, mid-backed chairs. The plan is for one of the walls to be opened up to local artists, so that they can exhibit their work for a month. Items won’t be for sale at Elements, but the artists’ details will be available for people to contact them direct if they want to purchase anything. 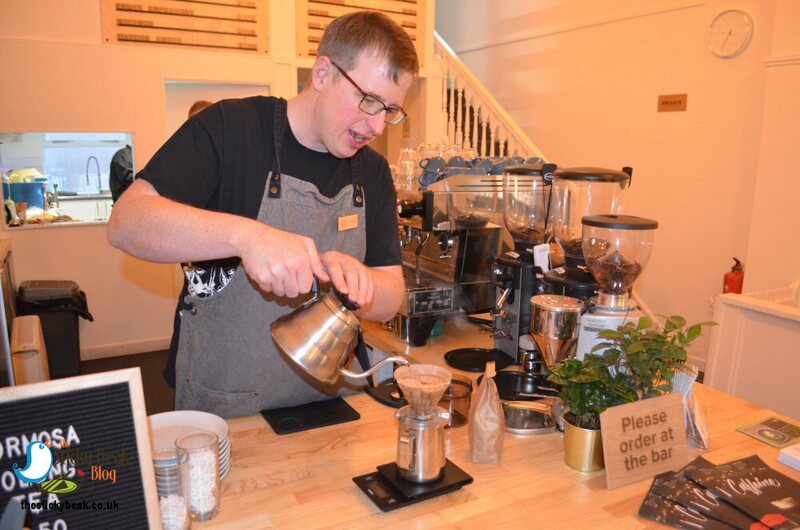 When we arrived, Pete was busy making a V60 coffee; one of the ones that is going to be served at a Coffee tasting workshop that the team are hosting the following afternoon to our visit. He kindly gave us a cup of said coffee and it was a fab tipple from Colombia with a toffee, honeyed finish that was a brilliant drink for first thing on a Saturday morning. The first dish to be set before us was the scrummy smelling and beautiful looking Breakfast Muffin. 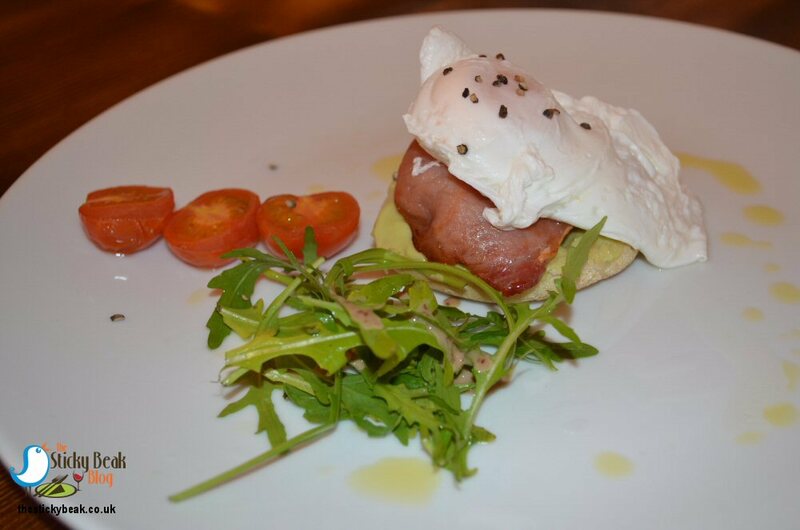 This simple breakfast staple comes in three different choices; an English muffin topped with Avocado Cream and soft poached Egg for £3.50, with added smoked Back Bacon at £4.50, or with Smoked Salmon for£6.75. We had the Bacon variety and wowser was it super! The muffin was lightly toasted and smothered with a gorgeously tangy Avocado cream that was silky smooth. On top of this was laid a thick slice of wonderfully meaty smoked bacon and the crowning glory was a ludicrously rich flavoured hens’ egg. Cracked fresh Black Pepper and the mustard dressing on the Rocket leaf garnish gave an extra zip on the palate too. This was bursting with taste, and satisfied our early morning hunger pangs. As you know dear reader, I carp on a bit about it being the simple pleasures in life that are the greatest things, and in terms of breakfast offerings you can’t beat Tomatoes or Mushrooms on toast. 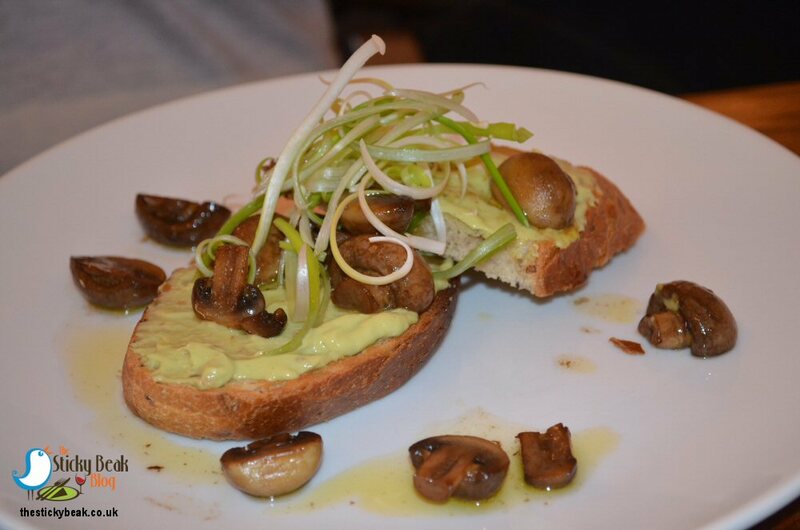 At Elements they serve a banging version of mushrooms on toast, priced at £3.50, which let’s face it is a cracking price too, and this was the second dish we tucked into. For your dollar you get the choice of white or brown bloomer toasted bread (cut nice and thickly) with more of that delicious Avocado cream and a whole raft of sautéed Mushrooms. We both loved the earthiness of the Mushrooms; in combination with the tang of the Avo cream it had our taste buds dancing happily. Vegans can happily tuck into this, as well as their vegetarian and meat-eating friends – it’s a real crowd pleasing classic, and comfort food at its finest. 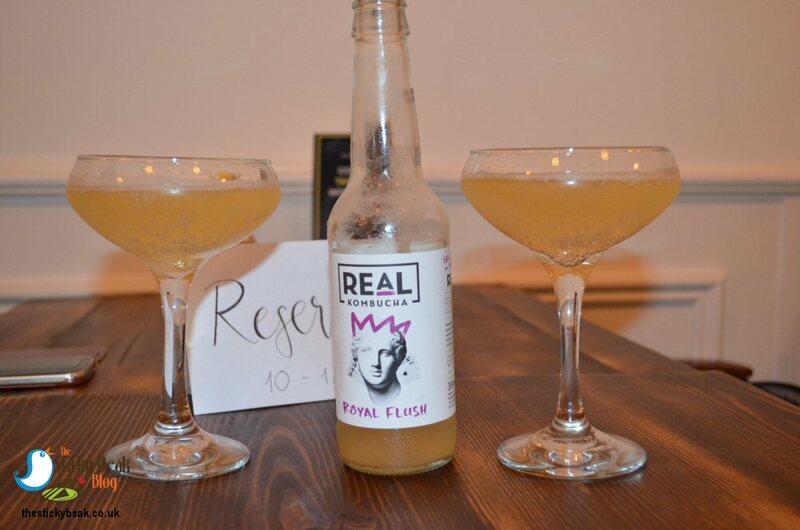 By this point we’d finished our refreshing “Royal Flush” Kombucha drinks that are made in England by Real Kombucha. The brightness of the first flush Darjeeling tea used to make this beverage came shining through in the mouth, its fruity notes clearly discernible. The gentle effervescence of the drink gave it a lovely effect in the mouth too, and the fact that Pete served it in Champagne coupes gave it a real luxury feel. To be honest, if I found myself as the designated driver on a night out, I could quite happily drink this as an alcohol-free option and not feel as if I was missing out. Porridge is a hearty breakfast option as it provides slow release carbohydrates and is high in fibre too, both of which keep our bodies feeling satisfied for a good period of time. I’ve never had it with Turmeric before, so this was a first for me - at Elements they include it in their Fruit and Nut Porridge bowl. This was the most colourful, visually appealing breakfast I’ve ever clapped my beady eyes on, and there had been a lot of care and attention put into its presentation. 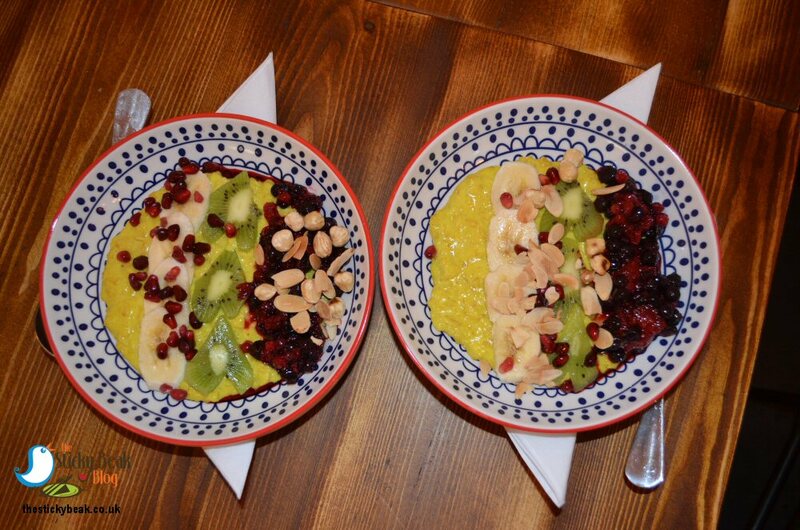 The subtle, golden toned porridge was topped with a rainbow of fruits, including slices of fresh Banana, heart shaped slices of Kiwi fruit, ruby-hued Pomegranate seeds, and deep purple notes of Mixed Berry compote with all manner of currants in it. Freshly toasted whole Hazelnuts, Coconut and Almond slices provided a great range of textures and tastes, complimented by the creamy base of the Almond milk used to make the porridge. Again, this is an option suitable for Vegans, and with a price tag of just £4.25 it’s a great option for those wanting to eat healthily but keep their bank balance in the black! 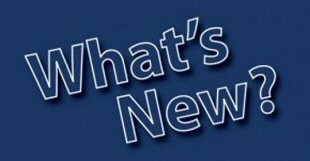 Elements like to push the boat out a little and give their customers something a little different, and this applies to both their food and beverage offerings. There are a lot of folk out there that love nothing more than a waffle for their breakfast, but I’ve always thought that it would a bit stodgy for me and have swerved them at this particular meal time. 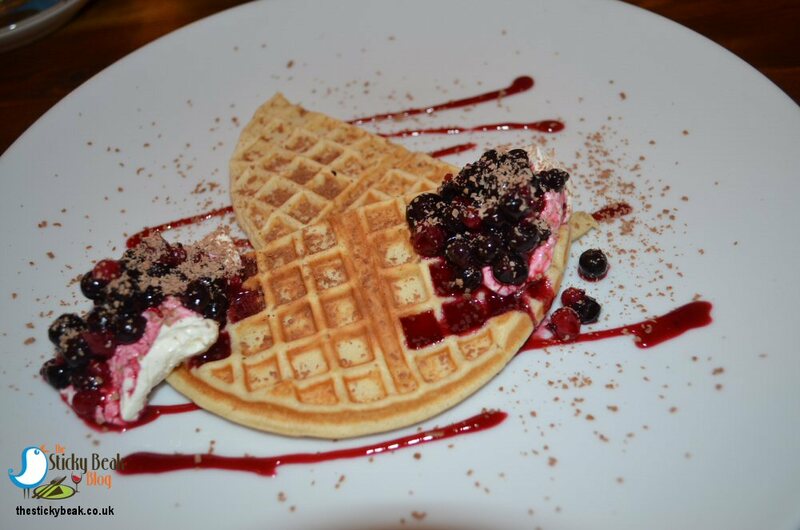 Enter the Scandinavian Waffle on offer at Elements Artisan Coffee and Tea house, with its Norwegian recipe that delivers a lighter, less claggy waffle. I pestered Pete for the secret and, whilst I didn’t get the whole recipe, he did say that Sour Cream and Cardamom are in there, making it less sweet and Carb coma-inducing than its common counterpart. The Scandinavian style Waffles come in two variants: Fruit Compote and Sour Cream or Maple Syrup and Walnut, both priced at £2.75. In order to bring you the complete low-down, His Nibs and I had the two types between us and compared notes. Clearly the waffles are the same in both styles and they do indeed have a more savoury taste and lighter texture than more conventional waffles, and to be perfectly frank, I prefer them like this. They would work equally well as a dessert option, as the sweet factor could be ramped up with chocolate, confectionary or ice cream toppings. 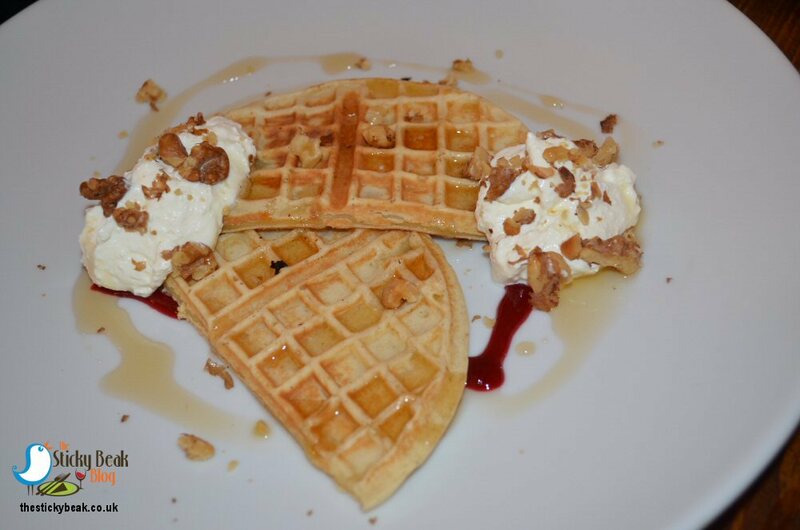 Personally, I loved the crunch of the Walnut pieces, and their lightly tart taste paired well with the sweet Maple Syrup. A swirl of Soured Cream kept things bright on the palate too, and this was a surprisingly filling, but light on the tummy, breakfast option. The Man Bird really enjoyed the zingy fruit compote option; it was fruitily sweet-but-sharp and went incredibly well with the soured cream. I guess it depends on what your personal preference is, but taste-wise they were both equally yummy. To round things off and give our tummies a little time to begin digesting the plethora of goodies we’d sampled, we had a hot drink. I fancied a Matcha Latte, priced at £3.30 (made with ceremonial grade Matcha) and His Nibs had a Macchiato which costs £2.30. The Latte was really refreshing and the clean notes of the Matcha had infused every bit of the steamed milk. 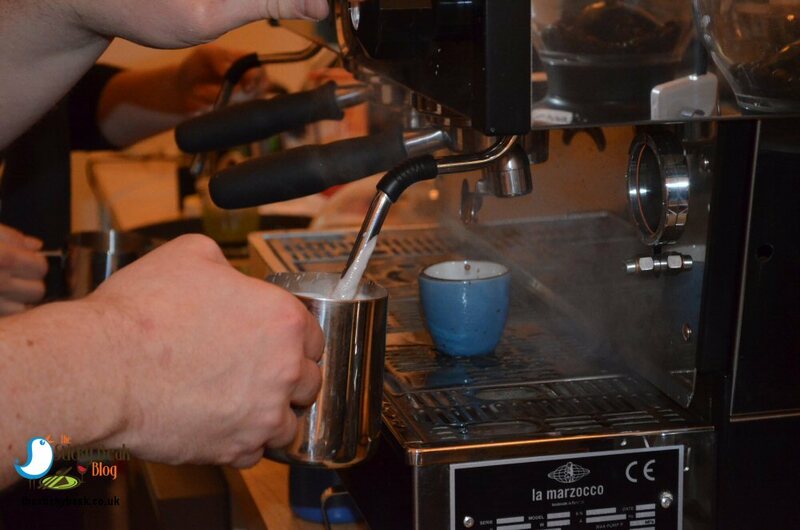 The Costa Rican coffee beans in His Nibs’ Macchiato released their intense flavour into the mouth, managing somehow to be soft as they lingered on the tongue with a hint of toffee. From start to finish we had an amazing time at Elements; Pete (Stephanie, Pete’s wife and partner in the business, wasn’t there), Teresa (our server), and Sam and Vicky (the Chefs) had all been so friendly and knowledgeable. The passion within this tight-knit team is evident to see, and they’re bursting to share this enthusiasm with all their customers. 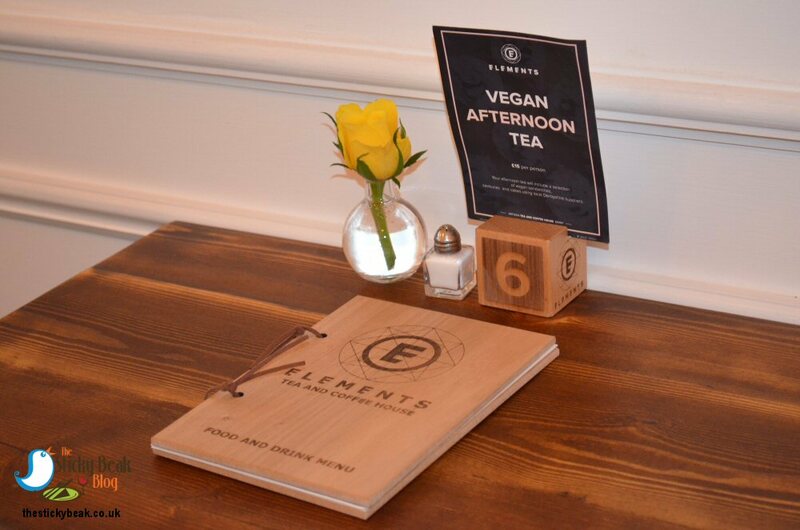 To this end, Elements are keen to run events on Sunday afternoons on at least a monthly basis; a Coffee Tasting Workshop was running the day after our visit, and a Vegan Afternoon Tea is running on Sunday 20th January – if you’re interested, pop in or contact them on their website for more details. I should just mention the lunch menu too, served until 3pm – it has some complete gems on it. 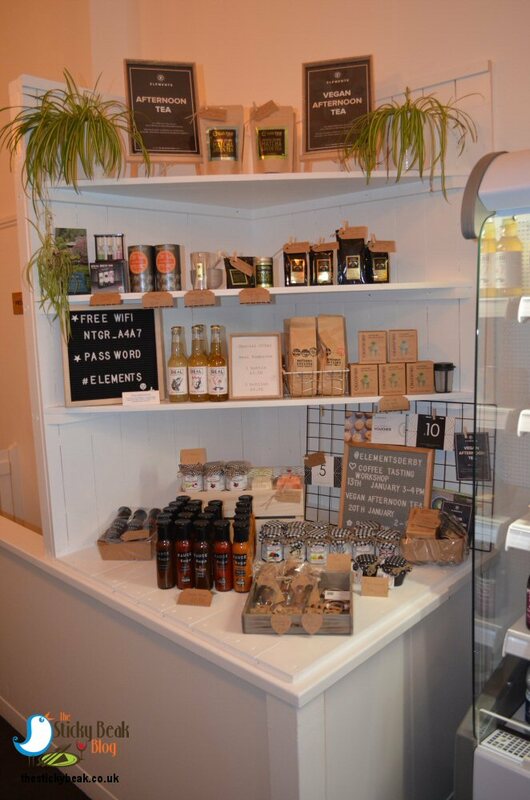 Sandwiches include pulled BBQ Jackfruit, Roasted Cauliflower, and Reuben varieties; prices range from £3.75 - £5.75. I noticed a lovely sounding Blue Cheese Flatbread (£4.95); The Man fancied the sound of the South Carolina BBQ Chicken option at £7.95. Chicken Katsu curry (£6), Coconut Dahl (£4.95), and Buddha Bowls are also on offer if you fancy trying those, prices range from £8.25 - £9.25. Kiddies can also enjoy lunch too: they can have a Teddy Bears Picnic (sandwich, crisps, piece of fruit and carton of juice) or a Vegetable, Pitta bread and Houmous dipping plate, priced at £2.95 and £3 respectively. Hot Wings definitely deserved at this cracking little venue! !